Daisy is our lovable, super cute, TSO Westlake Mascot!! 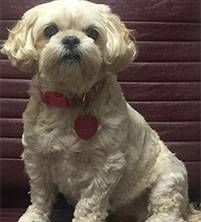 This bundle of joy is a seven years young half shitzu, have poodle mix. Her favorite activities include playing with her balls, lounging in her chair, and giving lots of sweet kisses. Daisy is an Austin native who enjoys some of the beautiful walks that her city has to offer.